A collection of important visualizations of poverty have been posted up at One.org. All of them have something to say, but I thought I’d share the one I think is the most important. 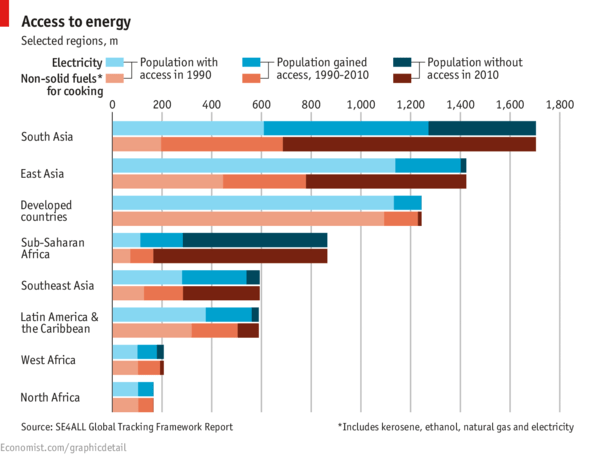 I was reminded of an article about access to electricity in the developing world. I couldn’t find that one, but there is a more recent feature was written by the CEO of the website that posted these visuals up. In developing countries, when you lose electricity, it’s usually temporary. And even if your power is out for the afternoon, you’re surrounded by businesses and infrastructure that’s running 24/7. To live in the dark – not just in your own home, but whole communities – is something that the developing world knows all too well. Former colonies, abandoned by imperial powers and left to rot, are left in the dark in other, less literal ways. Little or no access to the internet. Lack of literacy and libraries. Terrible transit infrastructure. Crippling poverty that makes almost all types of goods out of reach. There are a thousand ways to demonstrate inequality. It depends on what you are contrasting. Some inequalities only hit home when you got beyond domestic, and look at a global scale. This isn’t about people in different tax brackets, it’s the realization that billions of people have lights and billions do not.